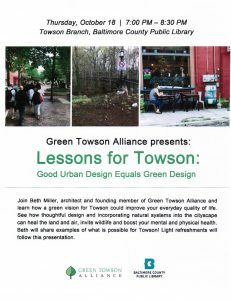 Join Beth Miller, architect and founding member of Green Towson Alliance and learn how a green vision for Towson could improve your everyday quality of life. See how thoughtful design and incorporating natural systems into the cityscape can heal the land and air, invite wildlife and boost your mental and physical health. Beth will share examples of what is possible for Towson. Light refreshments will follow this presentation.